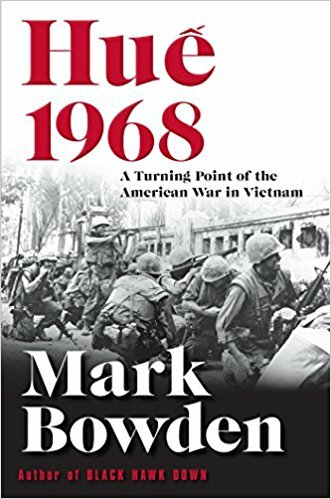 Gary Anderson, a retired Marine colonel, offers a review of Mark Bowden’s Hue 1968 for the Washington Times. A few years ago, I was lecturing my students on strategic surprise. I asked each of them to write paragraph on how surprise was used at Hue in 1968 based on what they knew of it. With few exceptions, the reply was that Hue was the battle where the Viet Cong won the war in a general uprising. These were graduate students, and their woeful knowledge of the Vietnam War was gained through the state of education in our high schools and undergraduate college programs. Their ignorance is more a comment on the “liberal” in liberal arts than in any defect in my students. Mr. Bowden points out that the Tet Offensive campaign, of which Hue was the major battle, was a strategic surprise that ranks along with Pearl Harbor and Sept. 11 as a colossal American intelligence failure. However, it was not planned and fought by peasant Viet Cong (VC) guerrillas. It was planned by the North Vietnamese general staff and political leaders in Hanoi and fought largely by regular regiments of the North Vietnamese Army (NVA); the VC were relegated to being scouts, guides, suicide sappers, and cannon fodder. The NVA and Viet Cong lost every tactical engagement and failed to achieve their primary objective, a popular uprising that would topple the South Vietnamese government and force the Americans out of the war. However, Tet was the turning point of the war because America’s leaders were discredited by the surprise and lost the confidence of a significant portion of the American public. Tet ruined Lyndon Johnson’s presidency. There was no “light at the end of the tunnel.” Although the last U.S. bombs would not fall until 1973, the North Vietnamese had irretrievably gained the psychological advantage. I don't agree. We fought in Vietnam to hold the line against world communism, which we did for a dozen years. The British won in Malaysia against the communists and we should have followed their example (Sir Robert Thompson wrote a fine book on how they won). We held the line in Korea and we could have won in Vietnam (or had a Korea-like truce) if only we had the political will. In our 12 years there we never lost a battle over company strength. And it should be noted that the North Vietnamese defeated the South Vietnamese in 1975 and not the American military. We had withdrawn all combat troops in 1973. In Tet 1968, as the book covers, we took out the Viet Cong as a fighting force and badly hurt the North Vietnamese, but the American public was led to believe (and as the reviewer noted, many still believe) that this was a defeat. Many people, including me, still think it was a mistake for the US to leave Vietnam in 1973. I can see why- it had been a long war, there were protests everywhere, mostly by people who didn't quite understand the war and the different sides in it, and the depiction in the Western media wasn't very accurate. But Vietnam after the reunification in 1975 has been an authoritarian state where the concepts of freedom and human rights simply don't exist. At least they should have done something to prevent the communists from attacking and taking over the South. The Paris agreement meant nothing. (I'm a Vietnamese born in the early 1990s. Moved to Norway several years ago with my mom as a political refugee. Currently studying in England). But then I suppose I think so only because I'm Vietnamese. Vietnam didn't mean much to the US. Too many Americans sacrificed their own lives for the war, I don't have the right to wish Americans had stayed longer. Di, your home country and your people have been through such difficult times in my lifetime, but I rejoice that you have made safe pilgrimage to a new home, and I am so very impressed with your language abilities, your intellect, and your blogging efforts. I wish we as Americans could have done more positive things for your country and people. As far as I am concerned, we tried to do the right thing (but our politicians ultimately made things worse). I wish you well in your ongoing pilgrimage. It was in American interest as well as Vietnamese interest to stay the course in Vietnam, as we had a common enemy, international communism. Our cut off of aid and support to the South Vietnamese was a dark day in both American and Vietnamese history. Vietnam today is a corrupt dictatorship, but we are allied as we now have a common enemy - Communist China. I hope the Trump administration is making efforts behind the scenes to help the Vietnamese people regain a bit of liberty. Paul, I definitely need to read and learn more. Thanks for making such good and useful points, and thanks for pointing me in helpful directions. Check out the six-minute video I linked to above and you should check out Philip Jennings "A Politically Incorrect Guide to the Vietnam War." You might also want to check out what I believe is the best novel to come out of Vietnam, James Webb's "Fields of Fire." Thanks, Paul, for your first-rate enhancements to my syllabus! Paul, I just had my eyes opened by the brief video, and I wonder how and why I was then and for so long oblivious to the post-Paris accord, Democrat party double-cross. Politicians! What a shame! Thanks for making my day (on this -- Dirty Harry's -- birthday). Glad to be of some service, ole shipmate. Paul, as I hope to spread the important word, I will be linking to your posting at my blog. Have a great day! How's your health these days? I hope you're doing well. Off the binnacle list and back on deck in spite of rough seas and foul winds. Onward!